If you didn't bring a 4WD the trail begins near the town of Big Water. 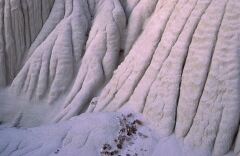 It's a 4 mile hike through a dry wash. Bring a headlamp , flashlight or full moon if you want to be at the hoodoos for sunrise. 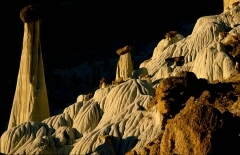 The first direct light will illuminate the hoodoos about 30 minutes after sunrise. 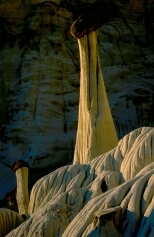 Golden light on "White ghosts"
Some people call these formations the "White ghosts" due to their spooky appearance. 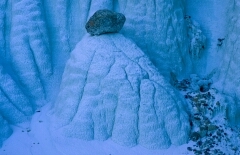 Once the sun is up the white rock will reflect the blue sky. Hence the blue color in the shadows. Even ghosts get the blues.